Some later studies proved that raw pineapple extracts cut down mucus five times faster than cough syrups that you can buy over-the-counter. Also, pineapple extracts helped patients recover 4.8 times faster. Besides that, all symptoms related to coughing, especially hacking, reduced considerably. It is well known that pineapples that grow in warmer places have many medicinal properties. For instance, it has an enzyme called bromelain, which has superb anti-inflammatory properties. It is a great pain reliever and is a favoured ingredient in supplements made for people living with conditions like arthritis. Pineapple is a great bet when it comes to fighting infections, even severe ones, and it also kills bacteria effectively. It is high on anti-oxidants and manganese, a mineral that helps keep bones and connective tissues healthy. Pineapple is great for weight loss as well because the manganese content helps metabolise fats and carbs. It also regulates nerve functions. What is definite is that, pineapple clears mucus and also reduces pain. This time around, instead of buying a cough syrup, try the recipe mentioned above. Pineapple must be eaten raw if you want to reap its benefits. And no matter what, a smile and a nap never fails to do good when you’re cranky and down with the sniffles. Quite fine! From the way where did you get that picture? Thanks for your comment. 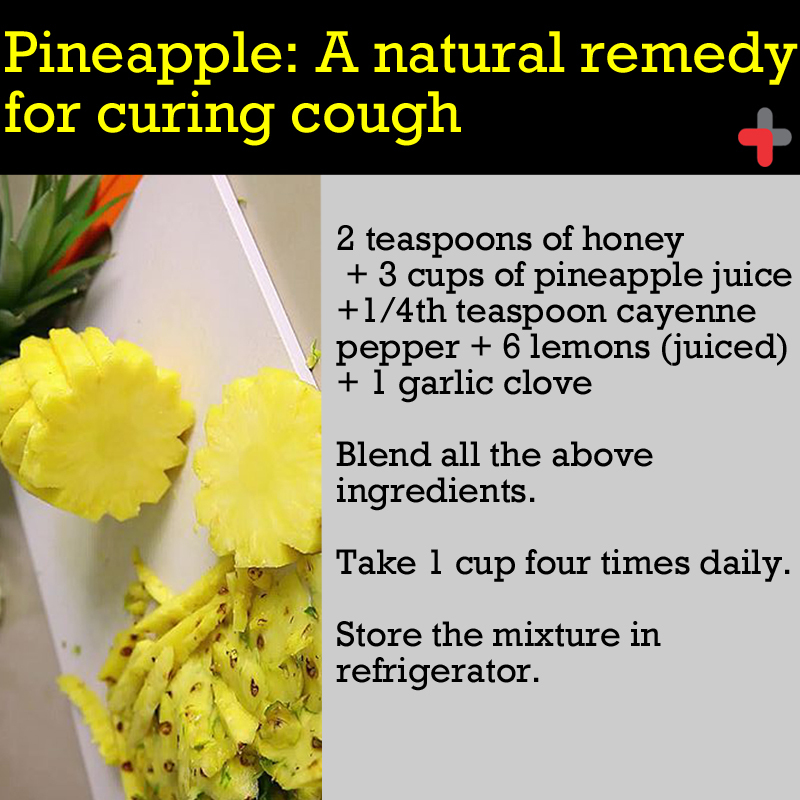 We hope this home remedy cures your cough issues. We make non-commercial posters for the blog and the pics are often clicked by us or taken from Google images via .org / .edu websites. Thaks for your blog. Hope this will cure my cough soon.